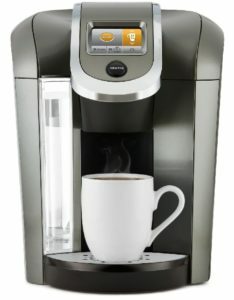 Coming from the US family of high-quality coffee machines, Keurig 2.0 K575 Brewer is the Keurig coffee machine with the largest water reserve. This appliance offers you an 80 oz water reservoir which makes it ideal for preparation of larger amounts of coffee. Let’s check out what the main features of this Keurig machine are. Beside the largest water reserve, this coffee machine has a modern design and comes in sophisticated platinum color. It weighs 13.7 pounds while its dimensions are 10.4 x 13.6 x 13.4 inches. 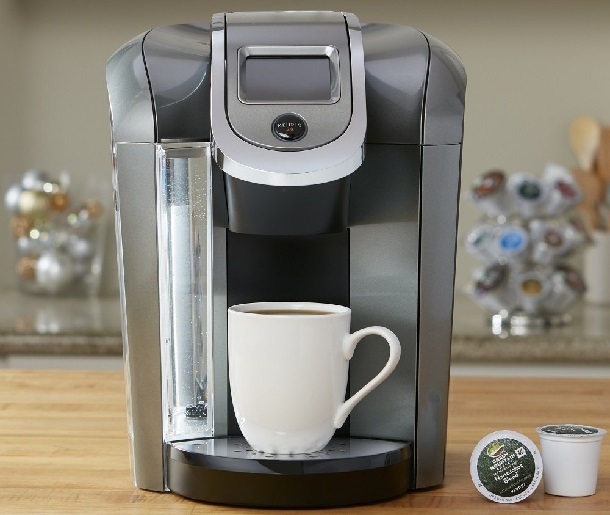 One of the main advantages of Keurig 2.0 K575 Brewer is the fact it’s compatible with Keurig 2.0 refillable K-Mugs, K-Pods, and K-Carafe pods, supporting a wide range of sizes. The sizes of K-cup that this machine can brew are 6, 8, 10, and 12 oz. The sizes of K-mugs are 12, 14, 16, and 18 oz, while the K-Carafe sizes range from 22 and 26 to 30 oz. The appliance use is simplified by the practical colored LCD display that makes it possible for you to program your brewer in accordance with your needs and customize your drink effortlessly. It also comes with a digital clock that has an automatic power on and off option. Additionally, its large water reservoir can be easily removed so that you can refill your water supplies any time in a pretty simple way. Another awesome feature of Keurig 2.0 K575 is the option of switching the nightlight colors of the appliance – it’s up to you what color of the reservoir will be lighting your kitchen. Energy saver mode, super large color touchscreen with a digital clock, and the possibility of choosing among the English, Spanish, and German language are some of the main features of this machine that will significantly affect your user experience. This coffee machine comes with six K-cup pods and a water filter handle as well as with two filters that will make your coffee-based drinks taste even better. However, you should know that it doesn’t include a carafe, which can only be bought separately. The most awesome thing about this appliance is the fact its huge water reserve can receive up to 80 oz of water. This way, you will be easily able to brew more than 10 cups of fresh coffee without the need of refilling the reserve. Thanks to this, this coffee maker will become your perfect partner in the process of simplification of your daily routine, providing you with as much coffee as you need in no time. Five temperature settings and the option of getting hot water on demand are also some great features that make it easy for you to get hot water quickly and enjoy your coffee at the preferred temperature. All you have to do is choose the adequate temperature and the brew size so that you can dispense water. Drip tray at the base is also a great thing, making the cleaning procedure easier. 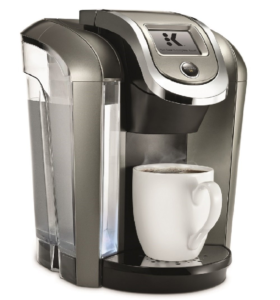 Keurig K575 is most versatile model that I ever have. Love large touch screen with all information about brewing. My favorite Keurig model.